Lincolnshire are the strongest opposition we face each year, with nearly 3 times as many clubs to pick their squad from, it is always tough to get anything from them, however following the scare we gave them last season at Overstone, hopes and confidence was high as we visited the home of Ping in the UK, Gainsborough GC. Having lost some of our team to the professional ranks over winter, we now have a job to do to fill their places, but we always box well above our weight and we are confident that our team can do well again this year. 3rd match we welcome to the squad Michael Farr playing with Tom Forster they took on Shaun Marshall and Adam Wainwright and should really have won it, but the greens, which had not yet reached there best, were not our friend on the last hole, but our first 1/2 point of the day. Lunch saw us 3-1 down and not much time for some of the players to get turned around and the welcome sunshine (at least for the specatators) was not helping the players. Being pretty sure they would put Ashton out first, we went with Jack Brown, who we thought might just disrupt his rhythm with his mint short game and for a few holes it looked like it was working as Jack was three up after 4. Eagle, Birdie, Par turned that lead over by 7 and several birdies later, Lincs won this battle 4/3. It was clear to see why Turner is in the England squad, he is a class act. 3rd up, Ben Jones took on Adam Wainwright. Ben's body language on 14 looked "I'm five down" but when I asked him how he was getting on, he said he was fed up with having to play out of his skin, he was -6 for the round and 1up, Ben continued on eventually winning 2up against quality opposition. Great result Ben! We were still hopeful that we could do it, with Paul Hodgkiss in control of his match, comfortably winning 4/2 a really classy performance and unbeaten on the day, it was great to have him back. Miles Mudge looked for a very long time like he was going to bring us another point, but needing a birdie on 17 to keep the match going, his 25ft putt slipped by the hole leaving an easy two putt for Matt Haynes to seal the game 2/1. 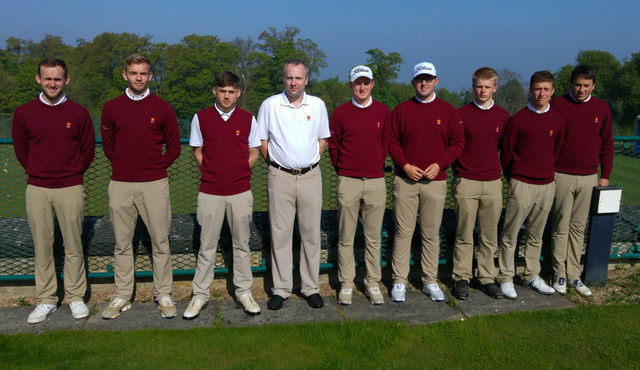 All in all, a frustratingly close match that could easily have fallen our way, but some really solid performances leaves us with high hopes for the Eastern Counties Foursomes and the season ahead. This team has plenty of talent and big hearts and while losing to the favourites was disappointing, there is no reason why they will not be fighting for the league at the end of the season.